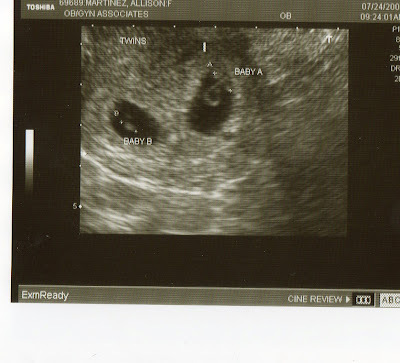 The Infertility Overachievers: IT'S TWINS!!! Yep you read that right!! I got to see both babies heartbeats. Baby A measured right on track with a heartbeat of 122, and Baby B measured 3 days behind with a heartbeat of 110. The Dr was NOT concerned with Baby B being smaller because he/she still fell with in the healthy size/heartbeat range. It was so amazing to see their little hearts beating, I was a sobbing mess laying on that ultra sound table. They gave me two REALLY cute u/s pictures. HERE THEY ARE!!! Oh on a side note: I puked this morning, let the morning sickness begin!!! Yay!!! Aly that is so exciting! So happy for you and Mike! Congrats!! Twins is sooo exciting!!!!!! I can't wait to see the pictures. I am sorry about the morning sickness. I was hoping you wouldn't get it! But I guess with Twins there is bound to be a lot of hormones! TWINS!!! AHHHHHH CONGRATULATIONS!!! I am sooooo excited for you guys!!! YAY ALY!!!! Twins!!! How exciting!!!! ALY!!!! Congrats! I just sent you an email letting you know we were thinking of y'all today, and then I checked this and saw your wonderful news! I figured it would be 2! I am SOOOO happy for you and Mike! So you ARE gonna tie me and Drew! YAY!!! I cant wait to hear more updates! You and your FAMILY are in our prayers! God Bless! YAAAAAAAAAAAAAY!!!!!! I was just about to call you before I hit the sack but I thought I would check oooone last time and low and behold you are back and posted up the awaited results!!! Twins (that was my vote!)!!! How awesome :o) I am smiling and tearing up for both you and Mike. What a wonderful blessing :o) I love you so stinking much and wish I could give you a huuuuge hug! I'll owe you one double time :o) Ahhh I am sooo excited!!! Love ya! PS- Hopefully this morning was your only throw up time, I heard you shold store up on crackers just in case!!!! OMG!! I am so excited for you! How exciting. I am a twin and I have twin nephew/niece. I hope you get a boy/girl pair!!! Exciting!!! YAY!!!!! I am SOOOO happy for you and Mike. What great news! I can't wait to see pictures. Oh my gosh, that is awesome! Congratulations!!! What a fantastic u/s pic!! Good Luck with the morning sickness! I'm so happy for you and your hubby!